On Wednesday, the Military in Zimbabwe seized power in a bid to rid the country of what they called "criminals" around the President. Military vehicles blocked roads leading to Government offices, parliaments and courts in the capital city of Harare. In a statement released by the Military, they said: "We are only targeting criminals around him who are committing crimes that are causing social and economic suffering in the country in order to bring them to justice. "As soon as we have accomplished our mission, we expect that the situation will return to normalcy. To the civil servants, as you are aware, there is a plan by the same individuals to influence the current purging that is taking place in the political sphere to the civil service. We are against that act of injustice and we intend to protect every one of you against it." Robert Mugabe, 93, who has led Zimbabwe since the country gained independence in 1980, last week sacked the VP, Emerson Mnangagwa and replaced him with his wife, Grace Mugabe, in a move many believed was geared towards making her his heir. As Mugabe's health declined, his wife's power and influence increased, as she started putting her political faction, known as the 'G40' in positions of power. The G40, including Finance Minister, Ignatius Chombo; Commissional General of the Police, Augustine Chihuri, and former information Minister, Jonathan Moyo are believed to be the target of the coup, and their whereabouts are currently unknown although a government source revealed the Finance Minister is currently in the custody of the army. The Military has since declared the First Family "safe and secured," which probably means they are under house arrest, and their loyalists imprisoned. 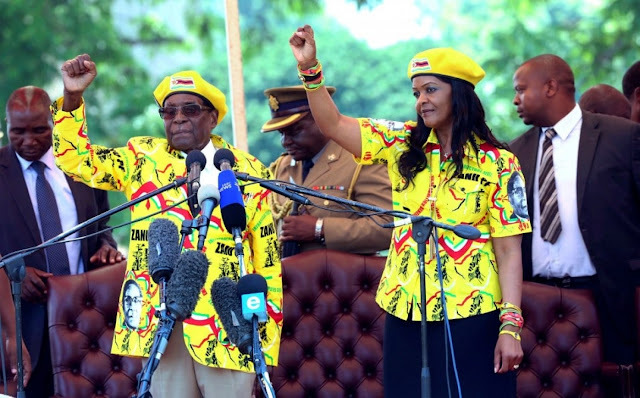 The political uncertainty in the country started after the last election in 2013 when Grace Mugabe started to consolidate her influence by expelling key members of the ruling party - ZANU - PF, and replacing them with those loyal to her. But that reached a boiling point when she orchestrated the ouster of VP - Emerson Mnangagwa, last week. It wasn't the first time she would meddle though. In 2014, she called for the ouster of then VP - Joice Mujuru, who was subsequently forced to quit. Before the coup, it was hard to know who was governing Zimbabwe between Mr. Mugabe and his Wife. Many observers believed she was in charge - like when a youth leader in ZANU - PF called a general - Mr. Chiwenga - who had asked Mugabe to rein in his wife, of embezzling diamond funds, probably at the behest of the first lady. It is now apparent she had gone too far. Her rising ambition, and fancy for fights, coupled with the firing of Mr. Mnangagwa triggered the Ar,my into action.